Love it or hate it, Proposition 13: The People’s Initiative to Limit Property Taxation, is about to go even further under the microscope. Proposition 13 is directly related to many of the budget shortfalls in San Carlos, from all of the department budgets at City Hall to the San Carlos School District. Below I have detailed the full history of Proposition 13 as well as its current effect on San Carlos. 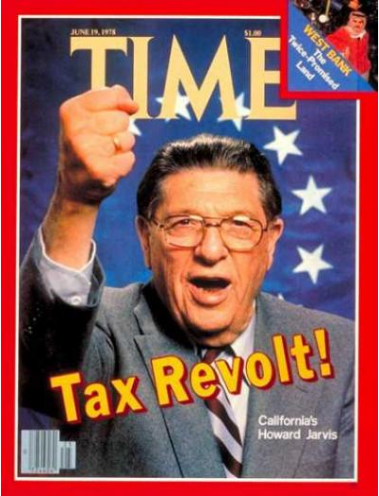 Passed by California voters on June 6, 1978, Proposition 13 gained national attention and was a main player in the “taxpayer revolt” of the early 1980s. Origins of Proposition 13 can be traced back to a 1976 California Supreme Court Case, Serrano v. Priest. This case illuminated California’s inability to abide by its own constitution as well as the 14th Amendment of the U.S. Constitution (which deals with equal protection). The California Constitution stated that the legislature was to provide a free education for each school district in the state. The 14th Amendment states that all have the right to equal protection under the law. The essence of the court ruling was that the amount of funding going to different districts was inadvertently favoring the more wealthy school districts, and thus other districts were not receiving the same “equal protection” as other school districts in California. Proposition 13 was the popular answer. After being placed on the ballot the measure passed with 65% of the vote. All but three counties in California voted in favor of the measure. To say that San Carlos schools have been crushed by the ramification of Proposition 13 is an understatement. When Proposition 13 passed, the local revenue that was once plentiful was cut by over 57%. As a result, the State of California had to step in and start to take over more of the funding of items such as San Carlos schools. The irony of this situation is that San Carlos thought it was doing its citizens a favor in the late 1970s by lowering the amount of its local property taxes that were to be earmarked for public schools. When San Carlos lowered this amount, the State froze that percentage and has made San Carlos exist on that low percentage ever since. In the late 1970s, supporters of Proposition 13 assured everyone that the State of California would make up the difference with any budget shortfalls to the schools. Obviously, this never happened. Not only did the State not make up the difference, the State instead started to raid the low levels of funding for other needs. Throughout the last 12 years San Carlos has been asked to do more with less money. Our schools switched over to a charter system as a way of attracting out of district students and maximizing its funding. The schools are essentially on life support and depend on parcel taxes, volunteerism, fundraising and the herculean efforts of the San Carlos Education Foundation, just to keep its head above water and keep the programs that have made it a wonderful educational experience for so many. Proposition 13 drastically cut the amount of local property taxes received by the City of San Carlos. In addition, State of California has been consistently taking a larger piece of the pie which is used to fund the city. The result is a fiscal emergency. The obvious answer is to modify the strict guidelines of Proposition 13. The problem is that most politicians will not venture near the topic for fear of the massive political clout and money behind the supporters of Proposition 13. As many baby boomers continue to retire in California and depend on the benefits of Proposition 13, you can expect even more pushback against any talk of modification. Many cities similar to San Carlos have added parcel taxes, utilities taxes, transfer taxes, increased sales taxes….basically anything that would give them an additional revenue stream. San Carlos sent Measure U (sales tax increase) to defeat in November which would have helped close the current budget shortfall from 3.5M to 1.5M. Also, homeowners who purchased late in the real estate boom, who still have their homes and have requested county assessors to lower their home value, leading to a lower property tax invoice. Good detailed and balanced explanation on a very complex subject. There is no doubt that Prop 13 has kept property taxes low for many homeowners which impacts funding at all levels of government. There is no doubt that Prop 13 contains inequities. One can certainly ask why a long-term homeowner should pay $3,500 a year in property taxes on a house worth say $850,000 while someone who paid $850,000 for their house last year should pay like $9,500???? So even a long-term homeowner like I who benefits from Prop 13 can see the inequities. So I understand the position of newer homeowners who feel the current property tax system is unfair. Of course on most controversial issues, there is more than one way to look at any issue and when each of us determines our position on any issue we often face competiting values that each of us feels is important and therefore we are conflicted. Hope this makes sense. So for me – while understanding the importance of education to all of us, I am also VERY CONCERNED about run-away government spending leading to massive debt on both the state and federal level. I believe in education and want to support it but I am angry and concerned about the financial irresponsibility shown by our political leaders. So do I choose to support additional tax increases to fund San Carlos schools or do I stay true to my belief that government spending is out of control and that they waste the tax money we send them? And that, IMHO the only way to stop this massive rip-off is to stop sending the government or any government more money?? I know some will say (with some logic), San Carlos has nothing to do with Sacramento and Wash DC and that the two issues are separate. I know some will say (again with some logic), it is not that much money to pay – no more than dinner for 4 at Town. I feel very strongly that until the money is cut off, government agencies typically will not look to reduce costs. Unlike private for profit companies tha thave an incentive to cut costs – higher profits, higher stock price, increased bonus amounts etc…..government agencies actually have a dis-incentive to reduce expenses – City Manager pay for example I am sure is a function on total $ budget and number of employees, etc. We saw that with artifical turf at Highlands, basically the grant from PAMF would have been lost if the new turf was not installed. So as we move forward as a community in regards to City issues or school district issues, I would ask those that support tax increases to maintain services that when you talk with other residents who might not as readily support tax increases as you do, please realize and understand that those who might not agree with you are not mean or uncaring or stupid or reactionary or whatever term you might feel best describes those who do not agree. Please try to understand that those who do not agree with you are trying to work thru these issues in a way that is consistent with their beliefs and opinions and that they are just as entitled to their opinion and decision as you are. I would say you will do far more to move people to your side by acknowledging and understanding that others’ concerns and priorities are just as valid as yours. I see great need to maintain educational quality. I also see great need to stop the fiscal insanity. How do I reconcile these goals? I don’t know but I am willing to talk and listen. Good article. Prop 13 is hurting the state, not just San Carlos. We are basically putting a huge burden on the next generation. When you add up things such as an under funded social security system and Prop 13…you have to start to wonder what kind of mess are we leaving behind for our kids. Like Arn I am also conflicted and “benefit” from Prop 13 with lower taxes. I’ve squared it up with myself (so far) through lending financial support to the specific causes I want to support, primarily public education in San Carlos. I am far more trusting and comfortable with the spending practices of my local school and SCEF than I am with those of government and it’s reflected in my giving. I hope others who benefit from lower, fixed taxes do the same, whatever their charitable cause of choice. You are absolutely correct in saying that what we are doing as a State and Nation is a travesty and you are correct this MESS is something our kids and grandkids will have to deal with. NO doubt and this is why I have such strong feelings towards these financial budget issues. However, I strongly disagree with your assessment as to the cause of the problem. Except for maybe the last year or so where the economy has put people out of work and thereby decreased tax revenues paid to the State and Nation, revenues paid to all government entities have increased over the past 5, 10, 15, 20, 30 years. Even at somewhat reduced levels in 2009, revenues (Taxes and Fees) collected are much higher than they were 10 years ago. The problem is that government spending on all levels have increased faster than the growth in revenues. Does anyone really believe this is not true? The US government spent $321 Billion they didn’t have (increase in national debt) in the MONTH of Feb 2010 alone – last Month! $321 Billion. Does anyone really believe this is a revenue problem? I have started trying to pull the data from the Web. It would be good to see a 10 or 20 year report from the City, the County, the State, or the Nation indicating the change in both revenue collected and money spent in any of these organziations. I believe we will find revenue has continued to increase (maybe slowly) while spending has just exploded. Since employee costs are the major cost of any government organization, increasing employee compensation and benefits clearly play a large role. I have recently seen a report which I will try to dig out again that indicates public employee compensation is now 45% greater than private employee compensation. Hard to believe. In the old days, public employees worked for less money in return for greater job security and benefits. This is no longer true. Is this a revneue problem? Many point to Prop 13 as a major issue. I agree the Prop 13 does decrease potential revenue but in my opinion, any decrease in revenue is but a drop in the bucket compared to the increased spending. I encourage everyone to review the attached County of San Mateo report to see what has happened in San Mateo County and specifically with Prop 13 over the past 10 years. The report is like 180 pages long, read it all if you wish, but if you just want information on property assessments and therefore property tax revenue, please review page 132 of the report which is page 164 of the pdf. Property taxes collected are based on the assessed value of the property so the total assessed value of property in the County reflects how much property tax is actually paid. Over the past 10 years EVEN with Prop 13, the total value of assessed real property in San Mateo County has increased for $68,989,934 to $139,551,172. That is a 102.28% INCREASE from 2000 to 2009. That’s about 11% a year! Not me saying this, not me fudging the numbers, these are the numbers right from the report. So we have a revenue stream that increases 11% a year but it still is not enough to keep up with the increase in spending. I will try to pull numbers at all levels of government. If anyone has these numbers, please share with the community. San Carlos numbers would be especially germane. I note per the Daily Post report on Monday, City payroll expenses increased 2.4% last year. So even with the City in a major cost cutting mode as per City Manager statements, personnel costs increased 2.4% last year. The financial issues we face in San Carlos are the SAME issues we face at the State and Naional level – no different – the same – costs are out of hand, revnues flat to slightly increasing. We all understand the power of compounding interest. It works wonders when the interest is being paid to you. It creates disaster when you are paying the interest. I believe the current deficits are only the tip of the iceberg and that in the next 3 or 4 years absent significant changes the increase in the defecit amounts will explode. I am not sure what the answer is but I am certain that if we continue to play the same game we have played the past 10 years, things will get a lot worse. Until we see the reality of the situation, we have no chance to make improvements. Since prop 13 will likely never be repealed, I wonder whether anything might be done on the legislative level to increase the percentage of money that San Carlos receives back from the state, so that it is at least similar to that of neighboring cities. On another note, I don’t understand why San Carlos thought it was doing its citizens a favor by lowering the amount of its local property taxes earmarked for schools. It strikes me as poor leadership. The San Carlos School District share of the property tax was frozen at the 1978 levels, just like the City share was under AB 8. At the time, the State Legislation used the property tax rate in place at the time from each agency (City, County, School District, etc.). If the City Council and School Board Trustees at the time had kept the property tax rate low (apparently so) then the rate in San Carlos is frozen at that low rate from 1978 forward. As for the projected property tax growth for the City budget next year, the projection from Saturday’s Budget Workshop was zero – no increase over the current year. I lived in a state where they taxed house transactions and it had a huge impact on real estate appreciation. It is not productive in terms of long term growth and outlook. PAMF to San Carlos which was earmarked specifically for field improvements to be used in conjunction with the Measure G money. There were questions which surfaced at the City Council meeting at which the synthetic turf was approved, as to whether PAMF would allow their grant to be redirected to other sources of need in the city. The opinion of the City Attorney was that in order to do this the City would need to re-open their agreement with PAMF and in doing so, anticipated that PAMF would also want to make changes that the City would not want to compromise on. Thank you for explanining the situation more effectively than I did. Often grants come with strings attached and expiration periods. Many San Carlos residents thought using this money to pay for current expenses and help keep more of our parks open was a better use of that money at this time than installing the new artificial turf field at Highlands. This could not be done or at least as Bob says The City determined it was not worth the risk to change the nature of the funding and so the money will be spent to install the new turf. And we see this same scenario (govt organzaitions having to either spend money or lose it) play out in other areas. We will see this “time” issue play out for the Hi-Speed Rail. Either the funds raised from the recently passed CA bond or “matching” federal funding have a time limit. I believe several cities and communities are considering legal action to fight the installation of the Hi-Speed Rail down the Peninsula. I believe Menlo Park and Atherton residents have already formed a group to do so. Other communities may join in these efforts. And one of the issues will be, folks in favor of the Hi-Speed Rail will push to make it happen before the funding committment expires. And if the issue ends up in Court, I am sure one of the arguments made in favor of building the Hi-Speed Rail will “if we don’t build it now, we will lose the money”. I will try to find the exact details. My overall point is that govt bodies are often incentivized (sp?) to spend rather than save money. Thanks Bob and Arn , I appreciate the information! Stop spending….. No more taxs please!!!! cut waste!!! Isn’t the real issue the percentage of property tax revenue that San Carlos receives? It is less than surrounding cities as I recall.